Take a day trip from Split to Plitvice Lakes to experience the most enchanting havens of nature in Croatia. The country is blessed with having eight national parks but one of the most captivating is Plitvice Lakes National Park, the country’s only UNESCO Nature Site. Located in the Kvarner region, there is a 250km distance from Split to Plitvice Lakes by highway. 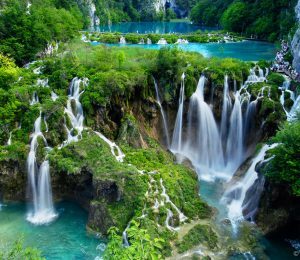 The Plitvice Lakes is Croatia’s largest national park spanning 73,350 acres, consisting of a series of cascading turquoise lakes, countless hiking trails, and even a panoramic shuttle bus. The water flows like thunderous waterfalls over mysterious cave entrances between 16 inter-connecting lakes, passing travertine barriers coated in moss. The result is a natural phenomenon of blue and green lakes in a unique forest setting where travelers from around the world come to experience its glory. Day Trips d.o.o. through its travel brand Šugaman Tours has decided to ensure you the best escape into the serene Croatian hinterland by visiting Plitvice Lakes National Park as a part of an organized tour. Start your explorations at Gornja Jezera (Upper Lakes) from the Prošcansko Lake at 693m altitude and follow the marked trails, taking in the sounds of chirping birds trying the outplay the noise of the gushing waterfalls. The trails will ascend alongside the magnificent interweaving of lakes or you can take a short off-piste jaunt to find a moment of solitude in the shade of a tree in the ancient woodlands. The dense forests are also home to rare bird species such as white-backed woodpeckers, golden eagles and peregrine falcons. DID YOU KNOW? : The lakes at Plitvice are constantly changing colors, depending on the organism and mineral content of the water that day, the time of year and the angle from which the sun captures its color. Continue along the many wooden paths that lead you over lakes and into deep caves before hopping on board a little boat at Donja Jezera (Lower Lakes) by Novakovica Brod at 503m altitude. Here you will get an up-close look (and maybe a little splash) of the superb waterfalls that are the reason why the landscape at Plitvice Lakes has been reshaping itself for thousands of years as barriers form, creating dry lake beds or where barriers fall, allowing karsk rivers and streams to find a new course of travel. You can also take a shuttle train ride through the park, guiding you past the 16 lakes before stopping at the highlight attraction, the Great Falls. The Great Falls is Croatia’s highest waterfall of 78 meters enclosed by steep cliffs, forming an amphitheater where audiences can take in a dramatic water spectacle. After an active few hours exploring the beauty of Plitvice Lakes National Park, absorb the moment from a vista point over a picnic-packed lunch. Alternatively, indulge in Croatian culinary feast of national specialties at a local konoba (tavern). When staying in Split, don’t miss a chance to experience the magnificence of the Plitvice Lakes National Park with a one-day trip from Split. To visit and experience Plitvice Lakes National Park from Split you can choose highly rated bus (or mini-van) group tour taking you directly from Riva in Split (or front of your hotel – take a look at our pick up locations for Plitvice group tour) to Upper Lakes of Plitvice National Park. 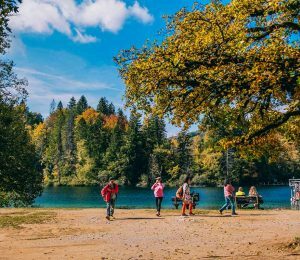 As we arrive at Plitvice Lakes the tour guide will guide you across multiple trails through the natural beauty of the Park which is difficult to describe in words. The first part of the tour you will walk the paths across Upper Lakes of Plitvice which is a system consisting of 12 lakes. As you explore this majestic system of lakes the tour guide will take you to the pier where the boat is waiting for your arrival. The group will enter the boat for the magnificent ride to the Lower Lakes of Plitvice National Park. Once there you will get the opportunity to enjoy in the roar of the highest Croatian waterfall, The Great falls. With the 78 meter drop you will get the first hand opportunity to witness the power of nature as it shapes and molds the environment around it. As you finish admiring the Great Falls our guide will take you for a panoramic train ride on which you can take numerous photos and enjoy in the scenery surrounding you. After the panoramic train ride through the National Park our guide will suggest you the local restaurant where you can enjoy in the traditional local cuisine on the optional lunch. You will have an hour to either have lunch or enjoy in surrounding nature on your own till its time to leave Plitvice Lakes and return to Split thus concluding Split to Plitvice Lakes group tour. If you are planning to go from Zagreb to Split why not choose the option of a bus or mini-van transfer with a stop and a guided tour of Plitvice National Park along the way. This is the best way to get from Zagreb to Split and enjoy in one of the 10 most beautiful lakes in the world (as stated by CNN). The guided tour of the Plitvice National Park lasts for 4 hours with additional hour left for an optional lunch in local restaurant or some more time to explore or to enjoy the Park on your own. Same as with the transfer from Zagreb to Split on the Split to Zagreb transfer with guided tour of Plitvice Lakes National Park we will pick you up right in front of your hotel. Once at the Plitvice National Park you will have around four hours of guided tour which is enough time to visit all of Plitvice Lakes landmarks and attractions. After the guided tour of the Park is finished our tour guide will recommend you the restaurant and even the traditional dishes you may wish to try on the optional lunch. As we continue towards Zagreb you will have one more break for coffee or refreshments before we reach our destination and finally dropping you off at your hotel. You can even choose to go on a private guided tour of Plitvice Lakes from Split. For groups of up to 3 persons the tour will be taken in a comfortable limousine while for the group of 8 persons we go on a tour with a mini van. Same as with the group tour the professional and knowledgeable guide will take you through all the landmarks of the park. The advantage of the private tour is of course in the tour departure and itinerary flexibility as the tour is organized exclusively for you and your group.